A Newcastle United football player has been banned for drink driving - while at the wheel dressed as Captain Hook. Chilean international midfielder Clarence Acuna was banned for two years and fined �1,000 for drink driving after the team's fancy dress Christmas party. The 27-year-old was stopped by police in his Mercedes on 16 December and appeared in court on Monday where he pleaded guilty to driving with excess alcohol. Newcastle Magistrates' Court heard how Acuna took his car to the Christmas party because he was dressed as Peter Pan's arch enemy Captain Hook and did not want to be seen. 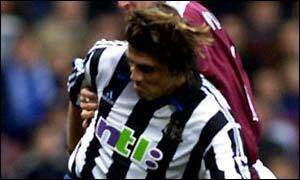 Acuna, of The Quayside, Newcastle, was banned for two years, fined �1,000 and ordered to pay �75 costs. The court heard how Acuna was pulled over on City Road, in Newcastle-upon-Tyne, where he was found to be more than twice over the legal limit. His solicitor Tim Hill told the court his client had not intended to stay at the party but ended up drinking five pints of beer before driving back to his home where his Chilean girlfriend was visiting. Mr Hill said: "Mr Acuna was attending the club's Christmas party and was in fancy dress. "His girlfriend had just arrived from Chile and she was cooking a meal that evening. "He went to the event to see his friends and colleagues. He had not been planning to stay out all night. "Unfortunately he was persuaded to stay out and he had more to drink that he should have done. "He foolishly drove back home. He took the car because he was in fancy dress and didn't want to be seen." Magistrates offered Acuna a 25% discount on his ban if he completes a drink-driving rehabilitation programme by April 2004. After the hearing, a Newcastle United spokesman said: "It is very disappointing but it is a personal matter and we do not intend to make any further comment."